The i-th x-axis coordinate is i/n where n is the number of observations in the response variable. The Lorenz curve will have a 0 to 1 scale in both the horizontal and vertical directions. A reference line is drawn from (0,0) to (1,1). This curve represents perfect equality in the income distribution. 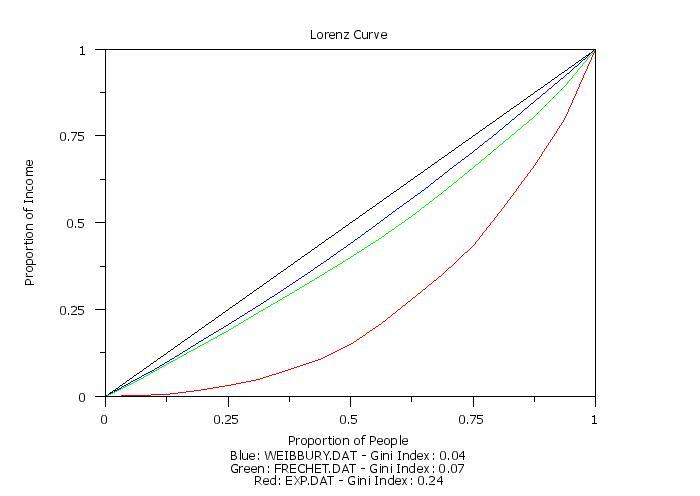 The greater the distance from the reference line to the Lorenz curve the greater the inequality of the income distribution. The Gini index has been criticized for not distinguishing whether the inequality is in the center of the distribution or from the tails. Note that <y> can be either a variable or a matrix. If <y> is a matrix, the Lorenz curve will be generated for all values in the matrix. The Gini index will be saved in the internal parameter GINI. This syntax will overlay multiple Lorenz curves on the same plot. Note that the response variables (<y1> ... <yk>) can be either variables or matrices (or a mix of variables and matrices). For matrices, a Lorenz curve will be generated for all values in the matrix. The Gini indices will be saved in the internal parameters GINI1, GINI2, and so on. This syntax will generate a Lorenz curve for each distinct value in the group-id variable. The Lorenz curves will be generated on the same page. Matrix arguments are not accepted for the REPLICATED case. The Gini indices will be saved in the internal parameters GINI1, GINI2, and so on. There will be a Gini index for each distinct group. This syntax will cross tabulate the group-id variables and generate a Lorenz curves for each unique combination of values for the <x1> and <x2> group-id variables. The Lorenz curves will be generated on the same page. 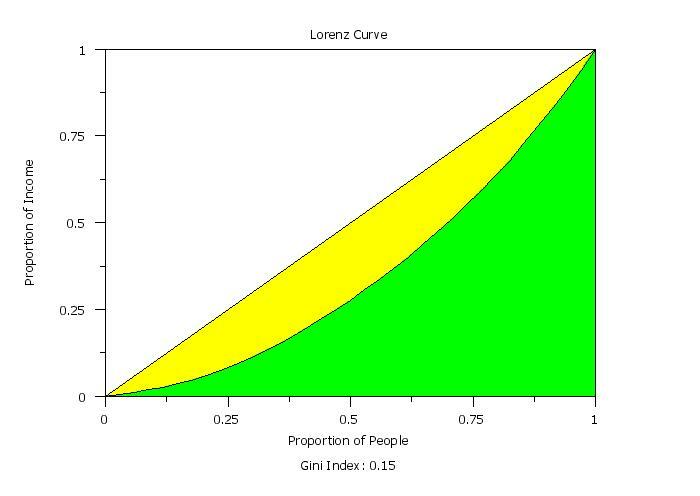 The Lorenz curve will not be generated if the response variable contains negative numbers. The response variable does not need to be pre-sorted. The LORENZ CURVE supports the TO syntax for the list of variable names. This is most useful for the MULTIPLE case. The interdecile ratio provides an alternative to the Gini index that can be more sensitive to differences in the lower and upper tails. INTERDECILE RATIO = Compute the interdecile ratio. VARIATIONAL DISTANCE = Compute the variational distance (a measure of departure from uniformity). UNIFORM PROBABILITY PLOT = Generate a uniform probability plot. Cobham and Sumner (2014), "Is Ineqaulity All About the Tails", Significance, Vol. 11, No. 1, pp. 10-13. Please email comments on this WWW page to alan.heckert.gov.